Definition at line 18 of file DispatcherM68k.h. Loads the iproc table with instruction processing functors. This normally happens from the constructor. Load the cached register descriptors. This happens at construction and on set_register_dictionary() calls. Make sure memory is set up correctly. For instance, byte order should be big endian. The only thing this dispatcher can be used for is to create another dispatcher with the virtual create method. Definition at line 85 of file DispatcherM68k.h. Definition at line 90 of file DispatcherM68k.h. Definition at line 96 of file DispatcherM68k.h. 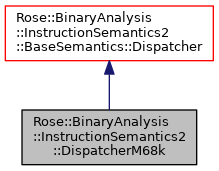 References Rose::BinaryAnalysis::InstructionSemantics2::BaseSemantics::Dispatcher::addressWidth(), Rose::BinaryAnalysis::InstructionSemantics2::BaseSemantics::Dispatcher::get_register_dictionary(), and instance(). Dynamic cast to DispatcherM68kPtr with assertion. Definition at line 106 of file DispatcherM68k.h. Definition at line 118 of file DispatcherM68k.h. Determines if an instruction should branch. Set floating point condition codes according to result. This register is cached so that there are not so many calls to Dispatcher::findRegister(). Changing the register dictionary via set_register_dictionary() invalidates all entries of the cache. Definition at line 29 of file DispatcherM68k.h. Definition at line 30 of file DispatcherM68k.h. Definition at line 31 of file DispatcherM68k.h. Definition at line 33 of file DispatcherM68k.h. Definition at line 35 of file DispatcherM68k.h. Definition at line 36 of file DispatcherM68k.h. Definition at line 38 of file DispatcherM68k.h.